Directors Torben Bernhard and Travis Low breathe life into a relic of Utah’s past with Boomtown, their short film showing this week at the Big Sky Documentary Film Festival in Missoula, Montana. In competition for the “Big Sky Award” given to best documentary focused on the American West, their twelve-minute film is the only one I have seen. Its story follows the well-known arc of a former Western mining town’s rise, heyday, and fall. Truly unforgettable, though, is the taut portrayal of Frisco, Utah as it unfolds through gorgeous cinematography, evocative sound, and expert research. Bernhard and Low recreate Frisco’s stunted history in a film short on length yet long on resonance. Silver mining was a boom business in Utah in the mid-1800s, no more so than in Frisco, situated on the southeast side of the San Francisco Mountains, west of present-day Milford. Transportation and industry went hand in hand as Utah’s railroad system expanded statewide. After the transcontinental railroad opened in 1869 across northern Utah, additional lines and extensions were laid: in 1871, the Utah Southern railroad line was extended from Salt Lake City to points south, reaching Frisco in 1879 via the Utah Southern Extension. The film opens with a broad view of the landscape. It takes a moment to discern the material remnants of Frisco’s former life: signs of human habitation and toil are represented by dilapidated wooden structures, the abandoned mine, and beehive-shaped stone-structured charcoal kilns. Amidst beautifully framed ruins and rusted material objects strewn across the land, the only living creatures we see in Boomtown are a tarantula skirting across the grass and a bull snake slithering across a gravel path. The once forgotten graveyard holds just a few of the town’s many dead. Yet it is a few past residents who bring the town alive to the viewer as the film seamlessly incorporates historical information through written text, audio tracks of interviews with former residents, and historical photographs – all granting us a glimpse of a functioning society in its prime. The inscription “Gone, but not forgotten” is etched on the side of stacked stones. Bernhard, Low, and their crew assure us with Boomtown that Frisco will not be forgotten. My only regret in Boomtown is its length. The film left me wanting more of everything it has to offer: our history retold through the beauty of expert film making; the remembrance of a lost, minimalist life surrounded by the sound of high winds and cawing birds; luscious images of rolling desert vistas drenched in golden sunlight, covered in brush and sage. This is the story of just one former Utah town in many, a story which can – and I believe should – be told time and again as we grapple today with the same issues as yesterday: how to make a go at living on these awe inspiring, sometimes forbidding, Western lands. 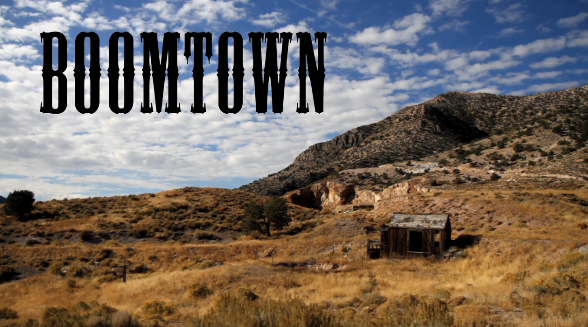 Boomtown is part of the Lost and Found Series, five short documentary films by Utah filmmakers that explore “what it means to lose something and what we can potentially gain from finding it again.” You can view a preview of Boomtown here. Find out more about the Lost and Found Series here. Great review. It puts in perspective how just a few years ago there was no radio. No wifi. No electricity. The wild west seem almost folklore. Yet, the evidence is right there. I am dying to see this. It looks to be outstanding. I’ve never been so jealous of a documentary concept or execution. Congratulations guys! I hope the screenings at Big Sky Film Fest went well!